Prenuptial agreements (PNAs) are not formally binding in England and Wales. This is in marked contrast to many jurisdictions, including Scotland, the rest of Europe and in most other jurisdictions where PNAs are regulated by law and are therefore commonplace. Despite the lack of legally based rules, PNAs are regarded by courts as persuasive and often decisive in many applications for financial relief following the breakdown of a marriage. Historically, it was regarded as contrary to public policy for a couple who were about to get married to make an agreement that provided for the contingency that they might separate. It was thought that an agreement making provision for separation might act as an encouragement to separate. In the past, therefore, such agreements were void and the court would pay no regard to them. Times have changed, and this is certainly no longer the position accepted by the public. Many people entering a marriage with the sense and foresight to consider what would happen if things go wrong, wish to enter into these constructive agreements, akin to insurance policies, to try to protect their financial position in the event of divorce. Despite appearing somewhat unromantic, this safety net offers a peaceful alternative to the throws of legal proceedings and helps avoid leaving your financial future to the discretion of the court. 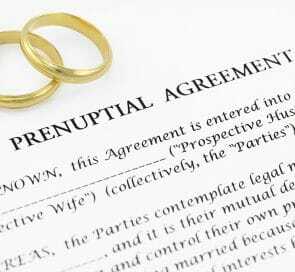 Will my prenuptial agreement be upheld in Court? Presently, the enforceability of a PNA will depend on the court’s view of its fairness. If it is deemed to be unfair to hold a party to the terms of a PNA, the court retains discretion to make financial orders. Following a review of Marital Property Agreements, in 2014 the Law Commission published a report which recommended the introduction of ‘qualifying nuptial agreements’ as enforceable contracts which would enable couples to make binding arrangements for the financial consequences of divorce or dissolution. In January 2017 the Government said that the Law Commission’s report and recommendations were still being considered and will respond in due course. “The court should give effect to a nuptial agreement [PNA] that is freely entered into by each party with a full appreciation of its implications unless in the circumstances prevailing it would not be fair to hold the parties to their agreement”. A number of other factors will be considered by a court, including whether each party has obtained disclosure or independent legal advice prior to signing the agreement. The court will also consider the proximity of time between signing the agreement and the date of the wedding (the implication being that the closer to the wedding date, the higher the chance of a party being pressured into signing the agreement). Our family team can offer independent legal advice to explain the details of a PNA, and help you prepare a PNA. Does a prenuptial agreement only benefit the wealthier party? Critics against enforcement of PNAs argue that there are implicit gender dimensions to the issue. As Lady Hale pointed out in Radmacher “the object of an ante-nuptial agreement (PNA) is to deny the economically weaker spouse the provision to which she…would otherwise be entitled.” Lady Hale notes that it is usually, although not always ‘she’, and argues that PNAs could leave women in a more vulnerable and ultimately worse off position than men. The Supreme Court did, however, specify that the agreement is only to be binding “in full appreciation of its implications unless it would not be fair”. The court has specified that if devotion of one party to homemaking (including childcare) has left the other to increase their income and potential earning capacity it is “likely to be unfair to hold them to the agreement that entitled their partner to retain all that they have earned”. In addition to the other factors (above) the court will consider the parties’ contributions to non-economic aspects of family life, and will award weight to the PNA accordingly. If prenuptial agreements are not strictly legally binding, why would anyone enter into one? As above, PNAs can carry decisive weight. Given that in recent years more people are entering into PNAs, there has been an increase in the number of cases involving PNAs before the courts; in these cases there seems to have been a move in favour of affording greater weight to PNAs. Case law is building up in this area, and judges are showing a willingness to respect the wishes of the parties based on agreements freely entered into (and which meet the various criteria above). “The reason why the court should give weight to a nuptial agreement [PNA] is that there should be respect for individual autonomy. The court should accord respect to the decision of a married couple as to the manner in which their financial affairs should be regulated. It would be paternalistic and patronising to override their agreement simply on the basis that the court knows best. This is particularly true where the parties’ agreement addresses existing circumstances and not merely the contingencies of an uncertain future”. If you would like independent family advice regarding a prenuptial agreement please contact our specialist family law team on 0800 437 0322 or request a call back online.